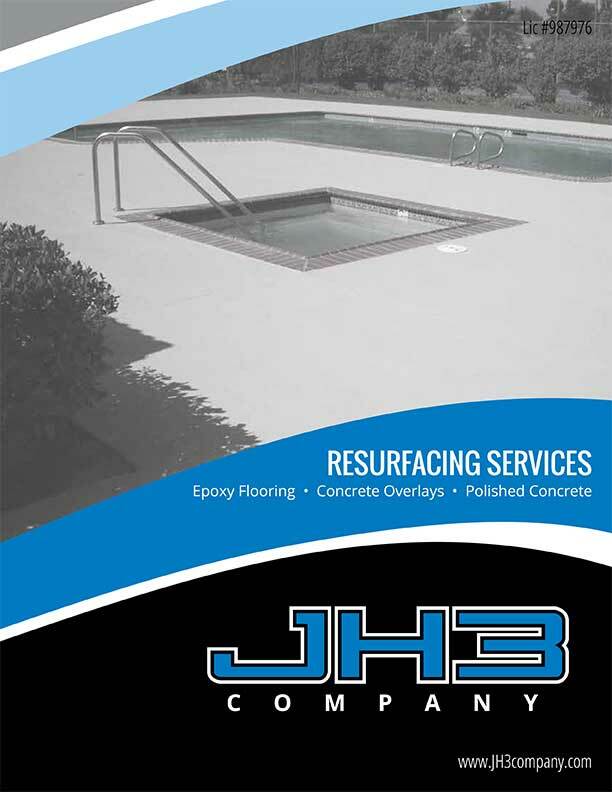 JH3 Company provides a wide variety of commercial decorative concrete resurfacing services utilizing the most advanced preparation techniques, texture styling and surface coatings. 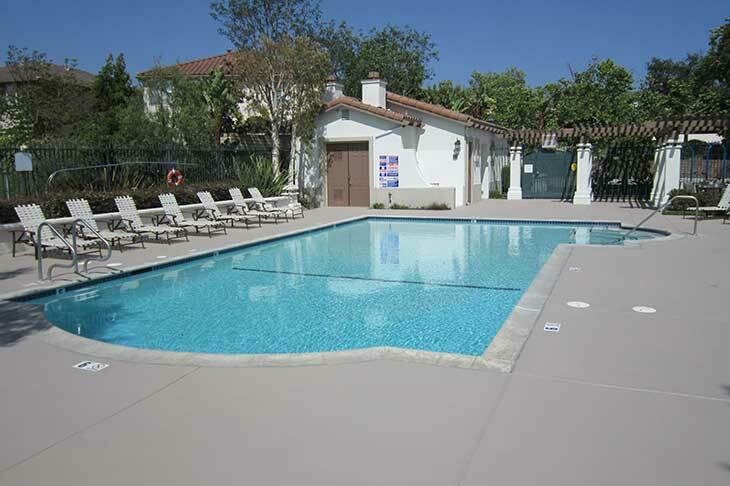 Our team of concrete resurfacing specialists have decades of experience resurfacing primarily swimming pool decks at HOAs, multi-family apartment buildings, hotels and motels. Please talk with us about your options for decorative concrete resurfacing and the best option possible for your budget and architectural needs in Ventura, Santa Barbara and Los Angeles counties. If you need a durable, scratch resistant floor to withstand heavy traffic, an epoxy floor coating is one of the best floor covering solutions to choose from. We provide all types of epoxy floor solutions for high-traffic, high-impact indoor or outdoor surfaces such as offices and warehouse floors. We will help you choose the best epoxy floor style to match your need for beauty, safety and strength. To achieve the desired result, we will mix the epoxy coating with different types of substances, such as decorative chips of mica, granite or quartz, quartz sand, terrazzo and gravel. Why remove and replace old, cracked and discolored concrete when you can simply resurface it? We can personalize your overlays projects with original designs that enhance your indoor and outdoor décor. Whether you choose to overlay with an engraving or acid stain, we can transform your traditional gray concrete into a work of art through dyes, textures and patterns. Concrete resurfacing overlays provide beautiful, long lasting and easy to maintain finishes for virtually any existing concrete floor surface. JH3 Company holds countless certifications for the installation and application of commercial resurfacing products and materials for epoxy flooring and concrete resurfacing. An abbreviated list appears below. Don’t see the product or manufacturer you hoped we work with? Just ask by calling us toll free at (888) 550-8856. How Much Does Concrete Resurfacing Cost? 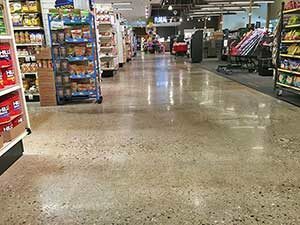 The cost to resurface a concrete floor or other walking surface varies based on square footage, choice of colors, finishes, patterns, existing surfaceway condition and other variables. 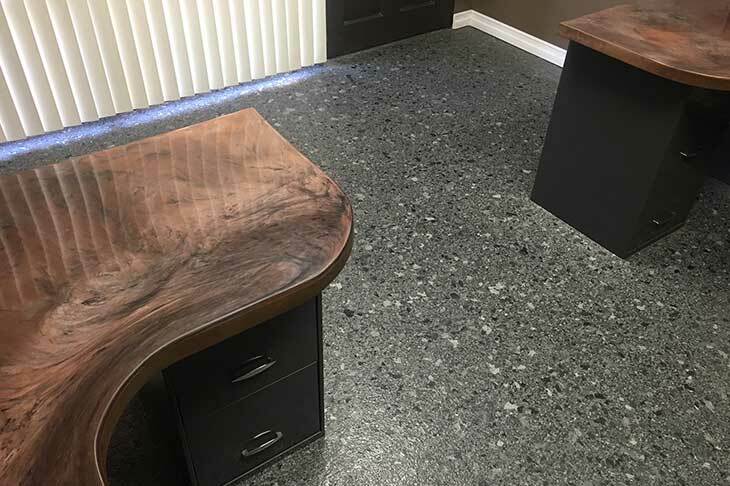 JH3 Company will be happy to provide you a free written resurfacing estimate by scheduling a visit to your office in our services areas. Please note that not all existing concrete can be resurfaced. The underlying base must be sound. We will determine if your concrete is suitable to be resurfaced or not. Get the financing you need for a concrete resurfacing project at home or work.